Make sure you have the most current version of Adobe Reader. ALL OUR DOGS ARE PETS FOR PATRIOTS ELIGIBLE! We're a shelter partner with Pets for Patriots. If you're a veteran or active military please check them out. The charity's goal is to give the most overlooked pets a second chance at life through adoption. We've partnered with them because we have the same goal. Every one of our senior dogs is an eligible Pets for Patriots dog. Join Pets for Patriots - it's free - and you'll also receive discounted pet care at 2 of their veterinary partners: The Fairfax Veterinary Clinic and Petaluma's Washington Square Veterinary Clinic. Our newest arrival is Jasper, a 7 year old Golden/Border Collie mix. He is owner surrender due to a change in living situation after a divorce. Stay tuned for more! Maddie, a 10 year black Lab, is an owner surrender. Two 1/2 years ago Maddie was left behind when her people moved out. The new tenants took her in. Sadly, they recently fell on hard times and could no longer care for her. Fortunately, Maddie landed at Lily’s and we are so glad she did, she’s an absolute LOVE! ​We'll post more as we get to know her better. 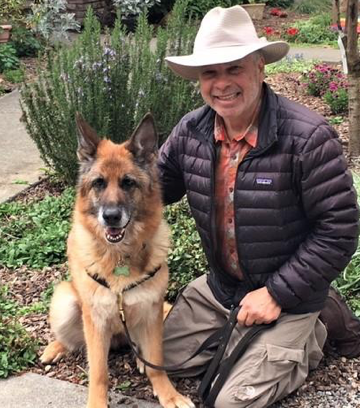 Lili, a 9 year old German Shepherd arrived at our sanctuary from an East Bay shelter. Allan, one of our volunteers came in for his shift and laid eyes on beautiful Lili. Allan has a soft spot for German Shepherds and it appeared right away to be mutual. Allan is going to provide a temporary foster home for her. He will give her the time and guidance she needs to adjust to her new life. Fostering Lili has been a real treat! She’s one of those dogs that quickly finds a way into your heart!! When she first arrived, we checked out the house and the yard and it all met with her approval. She settled in quite easily and was very appreciative of being petted and praised as well as going for nice neighborhood walks. Lili is so easy-going, will approach with tail wagging to get some affection and then is very comfortable hanging out on her own! Chewing bones, not toys or treats, are her favorite! She loves car rides and calmly waits until I return from shopping. Lili loves meeting new people, but does react around other dogs - we’re working on this – and have seen big improvements in only one week! On our walks, we’ve seen deer and squirrel which she watches with great curiosity but doesn’t lunge after – not a strong prey drive (Yay!!). Lots of compliments on her beautiful coat!! Lili knows her basic commands, responds easily to gentle correction and loves to please. Gunner is an 8 year old black Lab from a Yuba City shelter. He is a fabulous dog so it’s hard to figure out how he ended up a stray. He’s smart, has lots of energy and is eager to please. He wants to be with people and other dogs too. So far, we’re finding him to be a spunky, friendly boy who loves to chase the ball but doesn't bring it back! LOL! This beautiful 9 year old German Shepherd is a very special boy. He came from a shelter in Yuba county where he was surrendered by his prior family. They could no longer afford to care for him. Cody just wants to be with you. He is super friendly, on the smaller side, about 65 lbs and needs to put on a few pounds. He really wants his person and will bond strongly. He loves his walks and will be happy to tag along anywhere you might want to take him. At home he is a gentleman and will happily hang out and supervise whatever you are doing. If you are looking for a German Shepherd, don’t miss this beautiful boy. Martha is an 8 year-old Plott Hound who is looking for her forever home. She is an ideal companion, happiest when she is with you, yet also content to spend time curled up on her bed or playing with her favorite squeaky toy. She is a strong, active girl who loves to run, hike and go for walks. Her ideal family will be active and able to spend time with her outdoors going on adventures. Like most hounds, she does have a high prey-drive, and will chase small animals, cats, squirrels, etc. Martha has lived with other dogs and does well with them as long as she is properly introduced. Martha is spayed, housebroken and micro-chipped. Baby is a sweet spayed female Beagle/Lab mix, approximately 10 years old weighing in at around 70 lbs. She was originally adopted from a local shelter and lived in her last home for 9 years until the Paradise fire destroyed her serene life. She is very gentle, outgoing with people and tolerant of dogs and cats. Baby is a total cuddle-bug and wants nothing more than to love you. She's the best companion and comforts you when you're down. She is not aggressive, will happily sleep on your bed and not move until you are ready to start the day. Over all, Baby is low to medium energy. She is a good family dog (children over 5) or good for an older couple as well. She’s hoping for a loving forever home where she will be loved and can love you right back. Baby is currently with her foster mom and Lily's volunteer Debby while waiting for you! Baby is doing great and has become a wonderful companion! She took a trip with me down south to see my parents for a couple days, and met my friends and their kids and helped with story-time. She also went on an overnight trip with my husband and I to a hotel with a “dog suite”. She is an excellent car traveler! She loves everyone she meets and is easygoing and comfortable anywhere we go. She’s made some dog friends, too! She loves traveling with me around town and is a regular at the pet store and Michael’s. At home she is a loving cuddler, and she naps quietly on the couch between cuddle sessions. She sniffs at the cats when they let her, and is respectful of their space. Going for walks is her 2nd favorite activity, after cuddling. She is just a great pup! Spot came to us from the LA County shelter. His owner died on Thanksgiving day leaving Spot an orphan. The jury is still out on what breed this 10 year old neutered male might be. His head & body shape lean towards some type of Pointer. He is dog friendly but he will chase cats. Spot is healthy and ready to move on to his forever home. Our cute Henry, a 10 year old Rottie/Hound mix, came to Lily’s from the central valley where he was whisked from a shelter “just in time.” He weighs about 75 lbs and loves being outside – meandering around and sniffing. He’ll need a yard to explore. As long as he gets fed, gets to meander and has grass to relax on, he's happy. Henry likes to be petted but he’s not an overly affectionate fellow which could be due to the fact that he's quite deaf so NO hugs please - they may take him by surprise. He does want to be close by and if he sees you leave the room, he'll follow (maybe in hopes of that meandering sniff walk or a treat). And being deaf does not stop this boy from communicating. He will bark to let you know someone is coming to visit. Henry has occasional weakness in back legs, but you can't keep this curious guy down. Happy to meet you, he will saunter up, receive a pet, then wander off to roll in the grass & take a nap. He would be best in home with respectful older children and adults who understand the fact that he's deaf and will accommodate Henry's needs. No young ones who'd want to hug him. Henry gets along with low keyed dogs. Cats are encouraged to be introduced calmly. Offer him a soft bed, good meal and mutual respect and Henry will reward you with his whimsical presence. For information about adopting a dog, call 707-787-7010 or email lilyslegacysds@gmail.com.